NAIROBI, Kenya - An Italian cruise liner carrying more than 1,000 people was adrift without power in the pirate-infested Indian Ocean on Monday after a fire erupted in its generator room. Officials said the blaze was extinguished without causing injuries. The fire aboard the Costa Allegra occurred only six weeks after one of its sister ships, the Costa Concordia, hit a reef and capsized off Italy, killing 25 people and leaving seven missing and presumed dead. Both ships are operated by Costa Crociere SpA, which is owned by the Florida-based Carnival Corp.
Tug boats from the island nation of Seychelles were steaming to the powerless Costa Allegra, which was carrying 636 passengers and 413 crew members. But the tugs were not expected to arrive until Tuesday afternoon at the earliest. Italian coast guard officials said a large French ocean fishing boat could be the first vessel to reach the stricken cruise liner late Monday night. The officials, who were in regular contact with the Allegra's crew members, said emergency generators were keeping the ship's command room illuminated and instruments such as its radio functioning. But the rest of the ship apparently was dark as night fell. The officials said the cruise liner was holding steady, despite 5-foot waves in the area and that the passengers were being kept in the ship's big communal rooms, not their cabins. Italian Coast Guard Cmdr. Cosimo Nicastro told SkyTG24 TV that everyone aboard the vessel was safe. But the fire left the cruise liner adrift in the Indian Ocean because its engines weren't working. The general region where the cruise ship was adrift, off the coast of Tanzania, has seen a rash of attacks by Somali pirates, but they have never hijacked a cruise ship. Nicastro said armed anti-piracy military personnel were aboard, but he added that there appeared to be no immediate danger of pirates. Attention was being focused on rescue efforts, he said. Seychelles presidential spokeswoman Srdjana Janosevic said, "If pirates attack, the armed guards on board will respond. But as far as I am aware, no pirates have been sighted in the area." 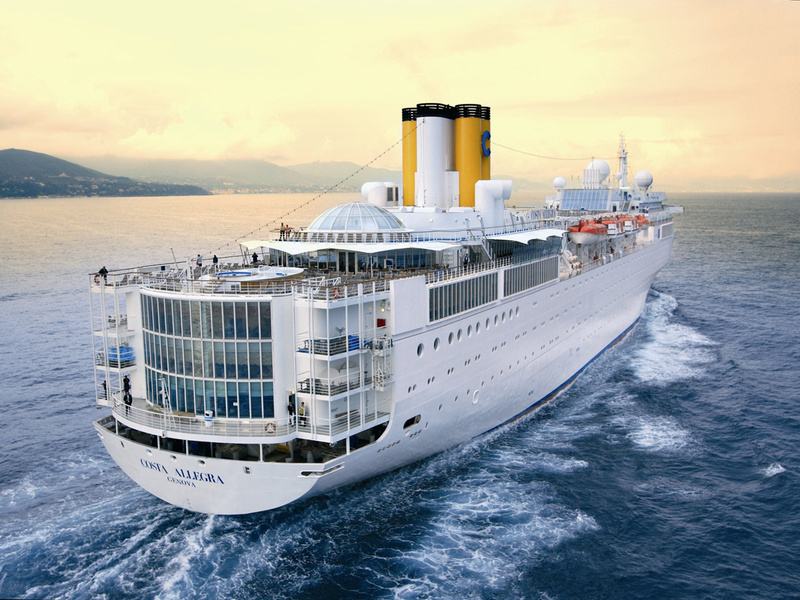 Costa Crociere SpA, which is based in Genoa, Italy, said in a statement that its ship was about 20 miles from Alphonse Island, one of the atolls in the Seychelles, a nation of islands and atolls that is a popular tourist destination. The Allegra had left northern Madagascar, off Africa's southeast coast, on Saturday and was cruising toward the port of Victoria, Seychelles' capital, when the fire erupted. Costa said the Allegra had been due in Victoria on Tuesday.